Russian philanthropist; born Feb. 8, 1833, in Zvenigorodka, government of Kiev, Russia, where he received his education. After the Crimean war his father, Joseph Günzburg, then a wealthy merchant and army contractor, settled with his family in St. Petersburg. Horace first came before the public in 1863 as one of the founders of the Society for the Promotion of Culture Among the Jews of Russia, the only society of the kind in Russia. He was one of the charter members of the society, and after the death of his father in 1878 succeeded him in the presidency, which office he still holds. He was the largest contributor to its support and one of its most energetic workers. The work which made him so widely popular among the Jews was his unremitting effort, in which frequent appeals to the Russian government were involved, toward the improvement of the legal status of his coreligionists, and for the securing by legislation, as well as by other means, of their economic and moral welfare. In the year 1870 he was summoned as an expert before the commission on the "Jewish question," which met under the auspices of the Ministry of the Interior. 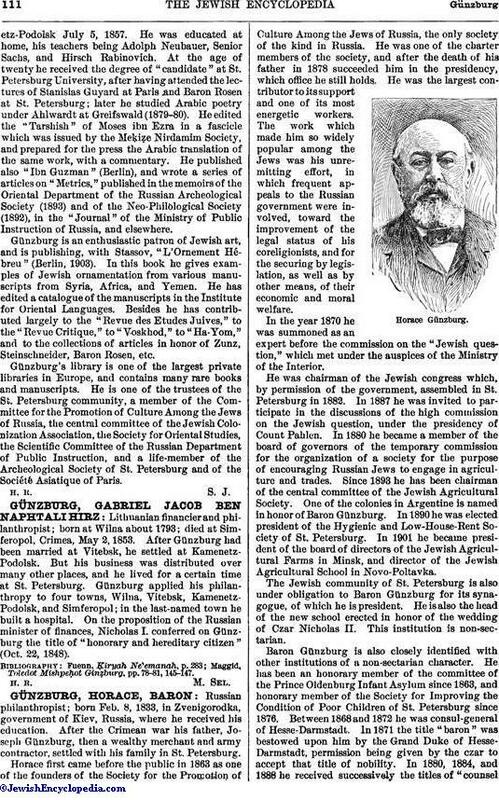 He was chairman of the Jewish congress which, by permission of the government, assembled in St. Petersburg in 1882. In 1887 he was invited to participate in the discussions of the high commission on the Jewish question, under the presidency of Count Pahlen. 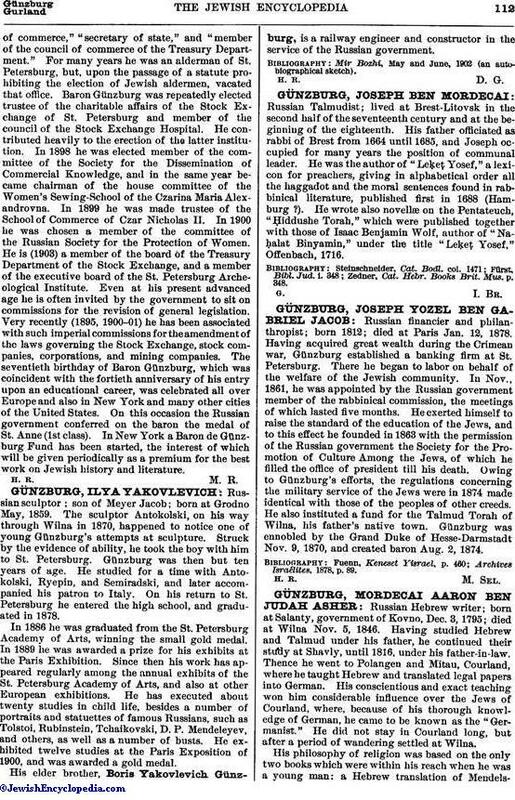 In 1880 he became a member of the board of governors of the temporary commission for the organization of a society for the purpose of encouraging Russian Jews to engage in agriculture and trades. Since 1893 he has been chairman of the central committee of the Jewish Agricultural Society. One of the colonies in Argentine is named in honor of Baron Günzburg. In 1890 he was elected president of the Hygienic and Low-House-Rent Society of St. Petersburg. In 1901 he became president of the board of directors of the Jewish Agricultural Farms in Minsk, and director of the Jewish Agricultural School in Novo-Poltavka. The Jewish community of St. Petersburg is also under obligation to Baron Günzburg for its synagogue, of which he is president. He is also the head of the new school erected in honor of the wedding of Czar Nicholas II. This institution is non-sectarian. Baron Günzburg is also closely identified with other institutions of a non-sectarian character. He has been an honorary member of the committee of the Prince Oldenburg Infant Asylum since 1863, and honorary member of the Society for Improving the Condition of Poor Children of St. Petersburg since 1876. Between 1868 and 1872 he was consul-general of Hesse-Darmstadt. In 1871 the title "baron" was bestowed upon him by the Grand Duke of Hesse-Darmstadt, permission being given by the czar to accept that title of nobility. In 1880, 1884, and 1888 he received successively the titles of "counselof commerce," "secretary of state," and "member of the council of commerce of the Treasury Department." For many years he was an alderman of St. Petersburg, but, upon the passage of a statute prohibiting the election of Jewish aldermen, vacated that office. Baron Günzburg was repeatedly elected trustee of the charitable affairs of the Stock Exchange of St. Petersburg and member of the council of the Stock Exchange Hospital. He contributed heavily to the erection of the latter institution. In 1898 he was elected member of the committee of the Society for the Dissemination of Commercial Knowledge, and in the same year became chairman of the house committee of the Women's Sewing-School of the Czarina Maria Alexandrovna. In 1899 he was made trustee of the School of Commerce of Czar Nicholas II. In 1900 he was chosen a member of the committee of the Russian Society for the Protection of Women. He is (1903) a member of the board of the Treasury Department of the Stock Exchange, and a member of the executive board of the St. Petersburg Archeological Institute. Even at his present advanced age he is often invited by the government to sit on commissions for the revision of general legislation. Very recently (1895, 1900-01) he has been associated with such imperial commissions for the amendment of the laws governing the Stock Exchange, stock companies, corporations, and mining companies. The seventieth birthday of Baron Günzburg, which was coincident with the fortieth anniversary of his entry upon an educational career, was celebrated all over Europe and also in New York and many other cities of the United States. On this occasion the Russian government conferred on the baron the medal of St. Anne (1st class). In New York a Baron de Günzburg Fund has been started, the interest of which will be given periodically as a premium for the best work on Jewish history and literature.